Bruce "Snake" Gabrielson was a true multi-sport athlete, scholor, successful contest surfer, board builder, and leader in the surfing world during Surfing's dynamic 60's and 70's. His first experience with surfing was in Belmont Shore in Long Beach during the mid-1950s, but it wasn't until the early 1960s that he began surfing seriously at the Power Plant in Seal Beach. His parents moved to Huntington Beach in 1964. Snake was a very successful contest surfer during most of his competitive surfing career. He started entering USSA contests in 1964, received a 3A ranking in 1967, and soon after placed as high as 3rd at the US Championships. That same year he finished 3rd in the final US Rankings. Snake continued contest surfing through the 1970s and then after he moved to the East Coast in the early 1980s. In the 1990s he retired from active ESA competition and only occasionally enters a longboard or legend event, mostly for fun. He also sometimes judges contests in the Mid-Atlantic region. 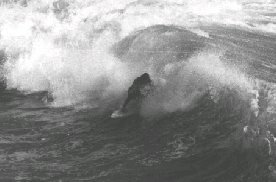 Besides a top competitive surfer, Snake was also a strong surfing organizer and leader. He was one of the founders of the first inter-collegiate surfing association while at California State University Long Beach. Then, while in graduate school, he founded the first official high school surfing league and first varsity surfing team in the US at Huntington Beach High School. He also founded Edison High School's surf program, plus published a book geared towards surf team coaches. Bruce was also a shaper and board manufacturer. Taught to shape by the legendary Dale Velzy during his tenure at Soul Surfboards, Snake opened his Wave Trek Surfboards shop in 1969, and continued making boards in Huntington Beach until 1978. Wave Trek was a leading innovator in board design, plus a strong contender in the Southern California manufacturer's team competitions during those years. Snake was the President of South Sea Surf Club in Huntington Beach in 1965 and 1966. Then, as President of Huntington Beach Surfing Association from 1967 until 1977, Snake successfully built the HBSA into a leading force in the surfing world at all levels from competitions to political influence. Additionally, as both the Western Association Director, and as a Director of the US Surfboard Championships, he was able to give the competition surfing world its "Declaration of Independence" from sponsor control and traditional community influence. 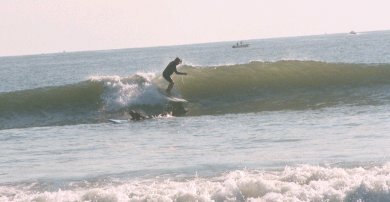 In the 80s, 90s, and 2000s, Dr. Gabrielson, a successful engineer in the field of computer security, took on a number of "give back" roles in the surfing world. He has been an active speaker for many surf organizations, clubs and schools since the mid-70s, has been a strong supporter and spokesperson for the Surfrider Foundation for several years, has become one of the worlds leading mentors for numerous high school and college students doing serious research into various surfing related areas, has joined and supported surf clubs and museums throughout the US, personally led the development of Internet use for surfing sites, and has worked with various national sports organizations, including the USSF, to help gain surfing's recognition as an Olympic sport. Among his notable sport firsts, in 1993 he put the first surfing oriented web page on the Internet and in 2002, he completed the USSF USOC application for surfing to become an official Olympic sport. 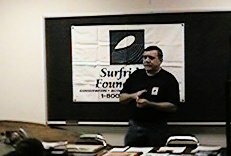 In 2005 Snake founded the National Surf Schools and Instructors Association to professionalize the industry and subsequently wrote another surf related book "Teaching Surf Instructors to Teach" as a manual for the organizaton. He also re-opened his Wave Trek Surfboards company, now in Chesapeke Beach, Maryland, and started shaping again. In 2012 Bruce became the East Coast director for the International Surfboard Builders Hall of Fame. In 2017 Bruce received an Honor Role on the Huntington Beach Surfing Walk of Fame for being the first varsity surf coach at Huntington Beach High School. In 2012, Bruce opened his Bruce "Snake" Gabrielson Surfing Museum and Surf Art Gallery in Chesapeake Beach. The museum has received a tremendous response and has been ranked among the top 20 Cultural Museums in Maryland by the Maryland Department of Tourism. the Shapers Tree Hall-of-Fame in 2008.